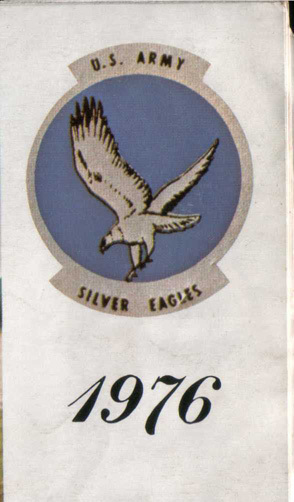 This is a copy of the program form the US Army Silver Eagles 1976 Air Show at Dobbins AFB / Naval Air Station Atlanta (NAS Atlanta), GA. Sorry the author did not take any pictures because he was only 10 years old at the time, but enjoy the program. Note: I think that this unit flew the same day that the US Navy Blue Angels Air Show in 1976. I just loved BOZO the helicopter. The US Army aviators that flew these helicopters did a fantastic job doing all the stunts that were performed. Unfortunately this unit was disbanded at the end of 1976. This show is what inspired me to want to become a helicopter pilot in the US Army, which I never did. I learned how to blow things up instead as a 12B Combat Engineer.